The thesis presented here runs as follows: Post-Keynesian economics has contributed to identify within the framework of the theory of effective demand, the conditions of sectoral disproportionalities on which a significant part of Marxian theories of accumulation and crisis are based. This happened not as a result of an explicit dialogue with the Marxian debates about sectoral proportions, but as a consequence of the analytical evolution of Post-Keynesian theories. In order to evince the connection between the Post-Keynesian theory of growth and distribution and the Marxian approach to the question of disproportionalities, it is necessary to accept the basic Kaldorian hypothesis concerning the level of development of the stock of capital relatively to total population, then it is necessary to reject the Kaldorian adjustment mechanism in favour of Hicks’s disequilibrium Traverse (Hicks, 1965,1985; Kaldor, 1956,1957). 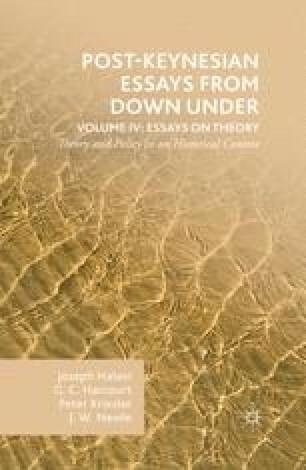 From the above it follows that I view Kaldor’s and Hicks’s contributions to growth theory as the central analytical core of Post-Keynesian economics. In fact, it will become apparent that the conceptual range of validity of Hicks’s structural disequilibrium falls within Kaldor’s hypothesis about the level of development of the stock of capital in a mature economy.